You’re invited to an exclusive dinner event at a private home in Burlingame, California with Dr. Eva Selhub, Stress-Resilience Expert and Best Selling Author on January 12, 2019 and to an exclusive lunch in Los Angeles, California on March 17, 2019. 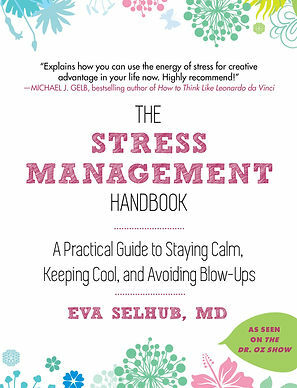 Dr. Selhub will be speaking about stress-free productivity and maintaining equanimity at work and home and signing her new book, The Stress Management Handbook. Fear, anger, and anxiety–the side effects of life’s everyday stresses–are natural and sometimes helpful, but left unchecked they can lead to a host of debilitating ailments that are now so common we assume they are unavoidable: heart disease, arthritis, gastrointestinal problems, depression, and more. It is possible, however, to reverse the effects of these negative emotions or stop them entirely by connecting to the physiology of love and opening your heart, thereby triggering a series of biochemical reactions that lower blood pressure, heart rate, respiration, and adrenaline levels, stimulating physical healing and reinstating balance and well-being. Dr. Selhub will guide you through a life-healing process that can reverse the destructive physical effects of fear and stress and banish emotional wounds from the past. Through a simple-to-use plan of awareness, breathing, visualization, and verbal command exercises the process of activating The Love Response reprograms your brain and changes your biochemistry from negative to positive, putting you on a path to long-term wellness and happiness. Stress and life’s adversities as the come in form of family, job tasks, paying bills, health, negative emotions, and poor food choices are like the rain that falls into a man-made dam and never stops falling, putting the dam at risk for breaking, no matter how strong it is. The only way for the dam not to break is for it to have outlets of relief so that the water remains balanced and level. Your life is the same. Developing physical, mental and emotional strengths helps us get through life easier but without outlets for care and relief, your body will break, eventually breaking your spirit and keeping you from being resilient and happy. Dr. Selhub shows how to build a personal infrastructure based on healthy nutrition, exercise, social support, humor, meditation, spirituality and spending time in nature, that will help you become strong and resilient at the same time, support you through life’s stress and adversity and help you achieve a greater sense of wellbeing now and for the rest of your life.